What subtypes of influenza are found in birds? Influenza is naturally a disease of wild waterfowl; humans, like dogs, chickens, and whales, are occasional victims of mutated viruses from this vast global reservoir of viruses. In wild birds, flu viruses reassert and recombine wildly, mixing almost all the known subtypes promiscuously. There are 18 known hemagglutinin subtypes and 11 known neuraminidase subtypes. Two of each are only known from bats, so there are 16 and 9 that could occur together in birds, for a total of 144 possible combinations. Some subtypes of each are rare, and some HA and NA types don’t play well together. Which combinations have been found, and how common are each? 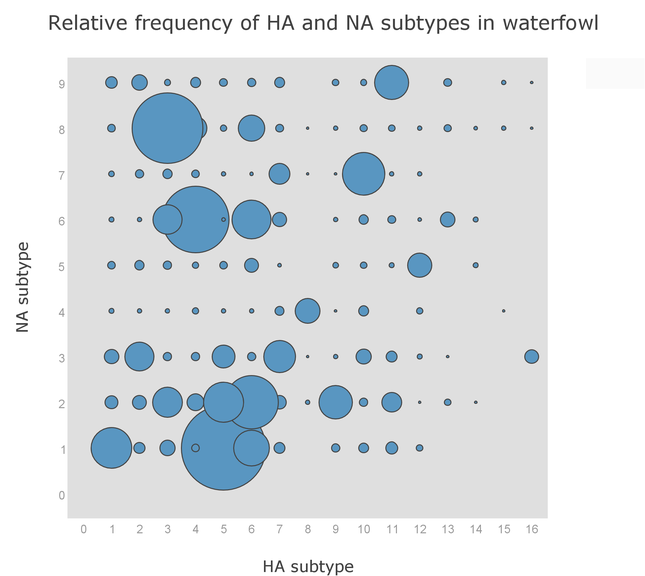 Mainly because I was playing with Plotly,1 I tried making a bubble chart of HA and NA subtypes found in waterfowl throughout history. I used sequences in the influenza databases, sorted by HA and NA, and plotted them with HA on the X axis, NA on the Y, and size of each bubble representing how common they are. Of course, this is not really a representative look. It’s wildly distorted by surveillance trends; people intensely test birds for H5N1 (because it’s lethal to humans), and H7N7 was surveyed mainly after multiple people were infected in the 2003 outbreak in the Netherlands, so those are probably over-represented compared to their actual prevalence in birds. Still, it helps give a sense of the complexity of the viruses circulating out there. This entry is filed under Science. You can follow any responses to this entry through the RSS 2.0 feed. Both comments and pings are currently closed.